Chat and share files over intranet or Internet (beta). Is there a better alternative to Nodescan Server? 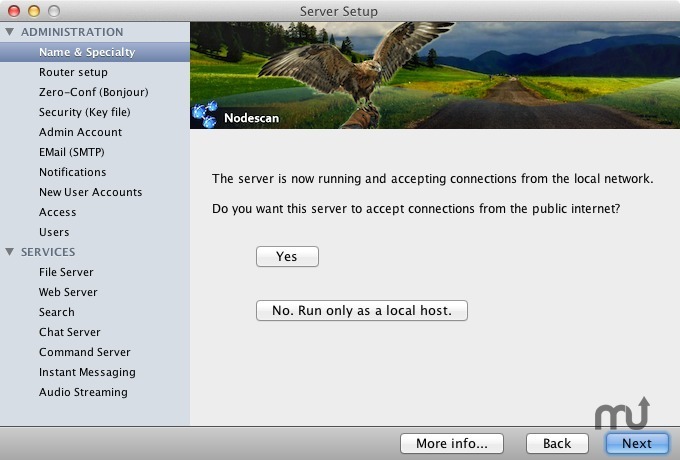 Is Nodescan Server really the best app in Servers category? Will Nodescan Server work good on macOS 10.13.4? Nodescan Server needs a review. Be the first to review this app and get the discussion started! Nodescan Server needs a rating. Be the first to rate this app and get the discussion started! Nodescan is a platform for private internet communication and file management. Nodescan Server includes a Web server and provides other services such as instant messaging, search, chat, and online file storage. The server runs as a standard application on any recent Mac (or PC) and no additional software or background applications are required. It can be run on a local network or over the public Internet. Running your own server ensures full control over your data and lets you decide who can access it. Nodescan Server offers additional functionality such as automatic router configuration (including Apple Airport routers), email notifications, and user account management. Nodescan Clientprovides access to most Nodescan server features. You can join individual and group chats; send instant messages; see who is online via a contact list; upload, share, and search for files; and listen to music via audio streaming. It is compatible with OS X, Windows, and Linux. Other instant messaging applications, such as iChat, Messages, Adium, Pidgin, and Empathy, can also be used to communicate via Nodescan Server; and Web-DAV applications such as Transmit, Cyberduck, and BitKinex can be used to upload and download files. A new feature called Web Share allows files to be uploaded, shared, and downloaded via a Web browser. 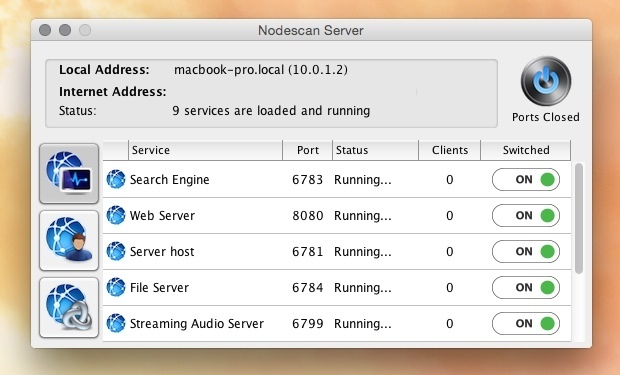 You can try out Nodescan Client using the publicly available server at nodescan.dyndns.org. No actual user information is required, just type any username and password and press Register. This server also hosts the full nodescan Web site (nodescanweb.dyndns.org) and offers a demo of the new Web Share functionality.